Most of the times I get a book on ebay I am extremely happy with it. A lot of the sellers will ship the book right away and the conditions are fairly accurate. Unfortunately, there are times when the books are not exactly what you expected. My first experience with books not exactly as advertised were when I purchased a few Astonishing Tales issues featuring Deathlok. The issues did not come in bags and boards for one. Who does that? Who has comics books without bags and boards, but more importantly who sells and ships comics without the bags and boards? Just wrong. The second problem was the fact that there was a gummy bear stuck in between two of the issues. How does that happen? The poor stray sweet ursa was some how dropped while these books were being laid together. A person handling old comics and eating candy repulses me as a nerd, but also baffles me as an ebay member. The comics were extremely cheap and I guess the above complications were reasons why. 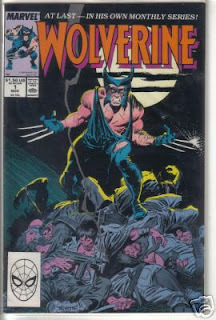 A book that is going for a much lower price than the comic's worth is usually a sign that something is up, and that is exactly what happened when I purchased Wolverine #1. Wolverine #1 was supposed to be in about near mint (NM) condition. I know that when getting a comic online to expect a slightly lesser value than quoted and so I was expecting a comic in fine(F) condition...which I was fine with. When the issue came it appeared to be beautiful. Very clean looking and wonderfully crisp on the edges. But then I opened the bagged and boarded book. The back had a crease right down the middle! The crease automatically bumped it down in value. I was so bummed. Needless to say I did not give that seller a 5 star review; however, I did not give them an incredibly poor review either. The book may not have been in the condition advertised, but I never asked for addition images of this comic of the day. I could have asked for some pictures of the back of the book, but I got excited and just bid and won right away. Though the seller was shady, I still blame myself for not being thorough. May Wolverine #1 be a lesson to all ebay buyers. Make sure you know what you are getting before you bid and then hope the images weren't fake.